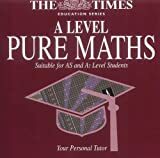 The Times Education Series A Level Pure Maths is an interactive CD-Rom designed by practising maths teachers and university lecturers and is based on the National Core for Maths at the Advanced level. Divided into chapters (which appear on the opening screen) the disc covers the following topics: algebra, functions, coordinate geometry, sequence and series, trigonometry, exponentials and logarithms, differentiation, integration, numerical methods and vectors. You open a chapter by clicking on its icon at the main screen. When the next window appears, you’ll see the chapter heading and a series of buttons along the bottom which will help you navigate the chapter, either a page at a time or by jumping to the start and end of the chapter’s sections (these are accessible from the top of the screen–just click the relevant tab). The navigation buttons are the same no matter which chapter you’re in and allow you to print out sections of the CD, search for particular words (and then follow them through the entire CD by clicking on the links); there are also two question buttons–quick questions which are designed to recap what you’ve just learned and exam-style ones which are expressed more formally and thus, more like the real thing. Sail Past the Beginners Level with these valuable tips! OFFER* Buy a paperback copy of this Python Programming book and receive the Kindle version for only .99 cents! Python can land you a lucrative job in numerous companies and dramatically increase your salary and earning potential. As you navigate these chapters, you will become quite adept in your journey to master the Python. You picked up this book because you are ready to improve your Python skills that you learned with the beginner’s guide. Well, congratulations! My hope is that the beginner’s guide was easy enough for you to understand that you are going to sail through this novel so that you can move from beginner to novice and beyond. In this book, we are going to take what you learned in the previous book and expand on those skill sets so you are able to understand how Python works even better. It may seem a little more complicated at first, but it is going to be easy once you get the hang of it. Are You Ready To Begin Your Adventure To Becoming A Master Python Programmer?